Fasten conduit to beams using these clamps, which don't require you to tighten a nut or screw for clamping action. Also known as hammer-on clamps, they can be clipped on by hand or installed using a hammer or pliers. One side of the clamp snaps onto a beam flange and the other side closes around the conduit when the clamp is compressed with pliers. 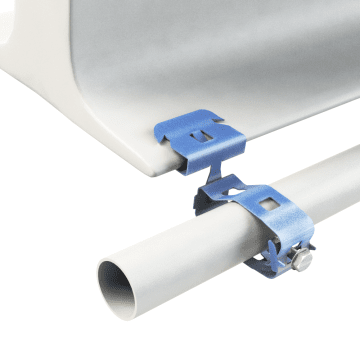 The clamps can rotate up to 360° to angle the conduit as needed relative to the beam.